I'm not sure if this has been posted yet or not. They originate in the 70s. I know for sure that I've seen these diagrams before, but I'm not sure if it was on the forum. Apologies if this is a repost. Anyway, here's a piece that has recently (?) 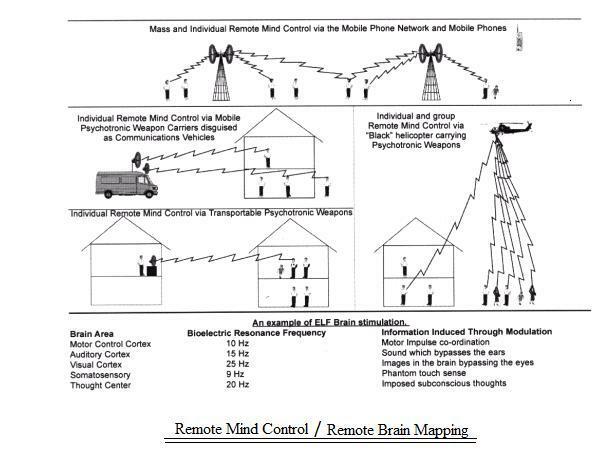 come to light about some of the myriad methods that the government has at its disposal for mind control programs. The interesting aspect to this is that it's seeing the light of day as a FOIA request. "When journalist Curtis Waltman filed a Freedom of Information Act request with Washington State Fusion Center (which is partnered with Department of Homeland Security) to obtain information about Antifa and white supremacist groups, he got more than the information he was looking for – he also accidentally received a mysterious file on "psycho-electric weapons" with the label “EM effects on human body.zip.” The file included methods of "remote mind control." "EM stands for electromagnetic. 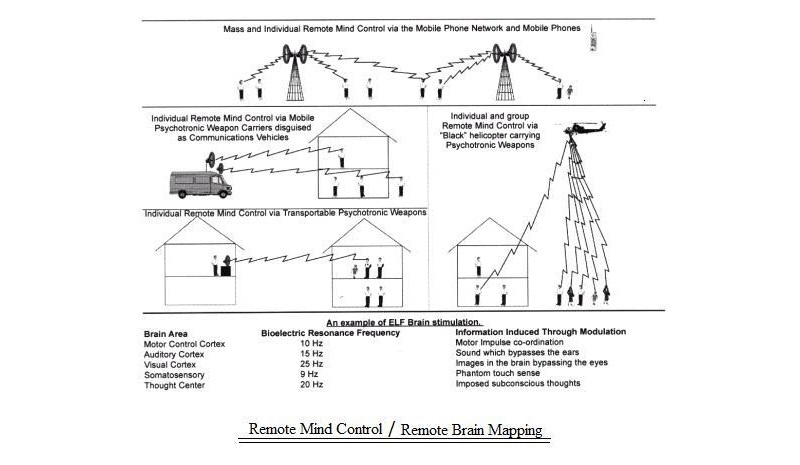 What you are looking at here is “psycho-electronic” weapons that purportedly use electromagnetism to do a wide variety of horrible things to people, such as reading or writing your mind, causing intense pain, “rigor mortis,” or most heinous of all, itching. Now to be clear, the presence of these records (which were not created by the fusion center, and are not government documents) should not be seen as evidence that DHS possesses these devices, or even that such devices actually exist. Which is kind of unfortunate because “microwave hearing” is a pretty cool line of technobabble to say out loud. You know what’s even cooler? “Remote Brain Mapping.” It is insanely cool to say. Go ahead. Say it. Remote. Brain. Mapping. Just check the detail on these slides too. The black helicopter shooting off its psychotronic weapons, mapping your brain, broadcasting your thoughts back to some fusion center. I wish their example of “ELF Brain stimulation” was a little clearer though." Last edited by Fellow Aspirant; 19th April 2018 at 23:14. A human being is a part of the whole, called by us "Universe," a part limited in time and space. He experiences himself, his thoughts and feelings as something separate from the rest—a kind of optical delusion of his consciousness. It’s difficult to source exactly where these images come from, but it’s obviously not government material. 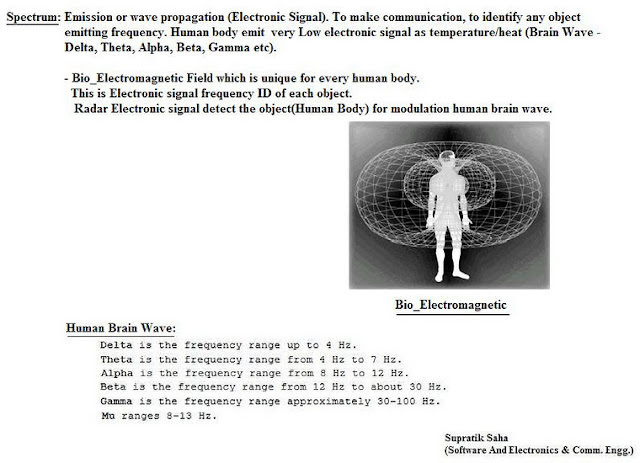 One seems to come from a person named “Supratik Saha,” who is identified as a software engineer, the brain mapping slide has no sourcing, and the image of the body being assaulted by psychotronic weapons is sourced from raven1.net, who apparently didn’t renew their domain. And it was Dr. Robert Duncan who used these in at least one of his presentations. Dear God. Let's hope this is a fake. Nothing here is surprising, nor is it in the least bit any new or groundbreaking information, but that doesn't make it any less horrifying to see in a diagram. I sometimes wonder what would happen if overnight, everyone were to Awaken and realize the truth. Imagine a world where, overnight, all of the evils of the underworld come out. There'd be hell to pay, and in blood, to be sure. But how long would it take for us to come out of it? What would we be like at the end of it? Interestingly, a fair amount of these have been happening to me. Probably coincidence. Death and destruction and especially the devils out there in human form would face the destiny of their own making. Yet I doubt that would a pleasant sight for any of us. It's a hell of a thing to look at the darkness from eye to eye. No one knows the answer for sure, but what we would see after that would be heaven on Earth. For all good is always founded on the truth. Seems that it's still a long way there. Humans aren't just ready to realize the truth just yet. One day it will happen. I downloaded the Robert Duncan ebook and plan to start "bravely" reading it today. I skimmed through the table of contents and spotted topics that Omnisense has posted about. I'm not sure if it's a synchronicity, but my mother emailed me an article related to the OP this morning. Parts of that scenario were scarily real to me. Black helicopters showed up several times AFTER I'd had an awakening and had contact with other worldly, other dimensionals. Five years later I am still wondering what those helicopters had to do with any or all parts of my experience. There's an intuitive part of me which thinks they were trying to map my brain, after I'd had contact. I still don't know what to make of that part of my experience. I still know that some people can't be hacked or mapped. There was also a part of my experience where some one or some thing had jacked my heart rate to over 220. I know because the medics said it out loud and then one said "that's enough". The whole thing was just really strange. Then, they sent some weird "doctor" into the emergency room to ask me questions. Inexplicably, because I wouldn't elaborate, they let me go. I would love to have answers. I am sure the government is aware of when people break free and they monitor it. It's really creepy and terrifying. I have an incredible admiration for real, truthful journalism because those are the brave souls who validate things we know to be true, when the rest of the world calls us crazy. I recognize raven1.net as Eleanor White's old website. Here's a link and the first three paragraph from a page on Richard Alan Miller's website that might be relevant to this thread. I just want to know, what the heck is a “forced caffeine field”? I think they can use this kind of stuff through people’s phones. Makes me want to get a landline and go back to the old days where you don’t know who is calling until you answer the phone. I have experimented with Soul Control through meditation which in turn can lead to Mind Control and more effective. All I needed was a clear Photo and the Real name of the person to control. However, I gave this practice up as it was not the right thing to do I felt and also the negativity of the target would eventually affect my own soul. Take the example of Mr. Trump. The image also contains the web address www.raven1.net which is now offline. wow This is incredible info , maybe done accidentally on purpose! Thanks dynamo. Were you doing this at the behest of some person or group, or for your own amusement? What did you hope to gain by this and haven't you ever thought someone could be doing this to you, if you are willing to do it to another? Although I don't doubt the veracity of what you are saying, because I believe all things are possible, I am disgusted that anyone would consider this a worthwhile thing to do. I just don't understand even entertaining the idea for a second. Not even a split second. This is what Omnisense talks about extensively. God knows what secret govt is capable of nowadays. So many of these processes would appear to a professional to be psychosis and you wonder how many people are misdiagnosed with such. It also makes you wonder about the nature of psychosis itself. I have been interfered with remotely and it isn't fun. It was of a short duration and not nearly as intense as what some people suffer -- but definitely not fun. Having a dream that is in NO WAY product of your own mind or even the collective mind of man is very eye opening! 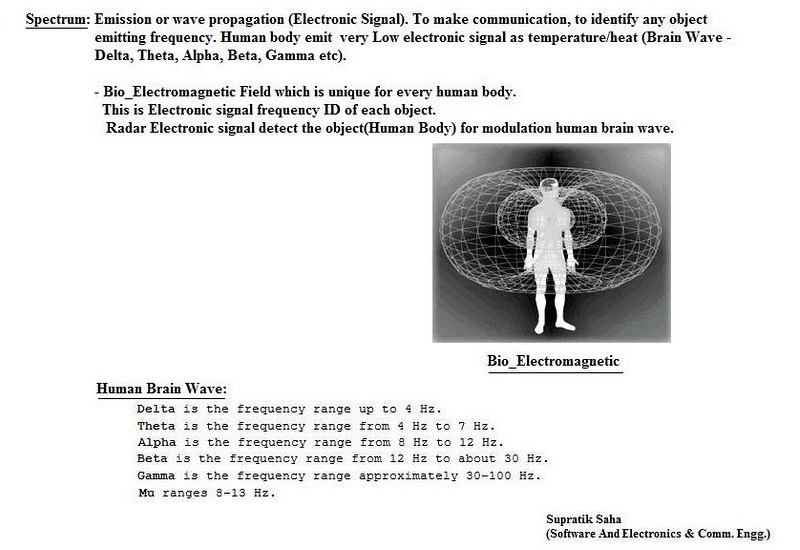 "Could these documents explain the mysterious Cuban “sonic attacks” where 24 government officials suffered “hearing loss, dizziness, sleep and vision problems, tinnitus, headaches, fatigue and brain damage”? Nearly all of these symptoms can be found in the first document." Fellow, I was fascinated with the account of what happened in Cuba for a few reasons. Firstly, the effects were verified by a number of doctors here in the states. Not just one. That always gives credence to what would otherwise be some out there conspiracy theory. No one argues with medical fact backed up by people with m.d. behind their names. Secondly, it happened to more than a few diplomats who had the same symptoms. People tend to believe diplomats. Thirdly, it was actually printed in a newspaper and out there for the average joe to read about. I really hoped at the time people were picking up on the truth of that story.